In a world first, media packaging supplier Novobox is launching a DVD/Blu-ray Disc box solution that works in tandem with an Augmented Reality application to access material related to the content. 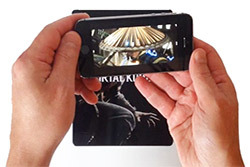 'Connected FuturePak,' the patented product designed by the French packaging company, works with apps like Layar or Shazam. Scanning the disc box cover with a smartphone opens the AR application that brings up a trailer, a website for special promotions or coupons and/or any other material defined by the user. Novobox offers the AR capability free for the first six months and charges €100 per month thereafter. Jean Noel Fournillier, the company president, told DVD and Beyond that the client can offer a free 6-month AR capability to its customers as well. The solution enables customers, for example, to see a movie trailer triggered from the DVD/Blu-ray box on the videoshop shelves before deciding to buy it. Connected FuturePak has just been unveiled and will be shown to packaged media distributors at the forthcoming gamescom fair in Cologne, Germany, in August. Click the image to watch the video demonstration.